These are changing times. Traditional operators focus on efficiency and on new products and services as a source for additional revenue generation. Customers are evolving digitally and require greater flexibility, simplicity, and transparency in relation to operators, TTO companies and other agents that make up the new ecosystem of communications and media companies. At everis, our mission is to make a difference in the market by focusing on promoting new methodologies and technologies to improve efficiency. We develop innovative solutions to increase revenue and shorten development cycles. We explore new business models to connect with customers and lead the transformation that is underway, under co-investment and co-responsibility models. Merger and convergence strategy; launching new services that expand the operators’ footprint, which promote new ways to generate revenue by incorporating other digital players and sectors. Strategic insight, accelerating time to market based on different next generation platforms and quick releases, experienced design, content management, and funnel and behaviour analysis. Monetising data and analytical services that enable the customer to be understood at all points of interaction and related services. Consumer and sales transformation strategy, commission and go-to-market models with a multi-sector dimension. Implementation of full stacks and large migration projects, introduction of technologies that enable real transformation, with agile methodologies and continuous integration. everis delivers development and maintenance models based on efficiency and productivity and is a lever for transforming IT and business areas. Strategy and network deployments, managed services, new network technologies and technical operations. Optimisation of internal and customer processes and designing the customer experience, which transforms sales and customer service, and delivers higher value services. 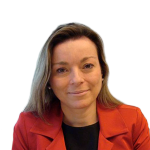 CEO of everis Brazil since 2013 and Head of Telecommunications in Europe, Eva has been a lead partner for business development in everis Public Sector for six years and a manager within the company. Her specialisation areas include business management, new business development and consulting & IT services. Eva has a degree in Economics and Business from the University of Barcelona and a Master in Business Administration from ESADE.